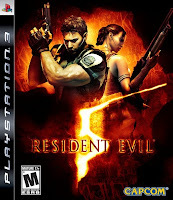 It would be difficult for me to speak about Resident Evil 5 without drawing connections between it and the game’s predecessor. For me Resident Evil 4 was an incredibly exciting gaming experience, and a huge part of this was the time in my life in which it occurred. It was early 2005, and Resident Evil 4 had just been released for the Nintendo GameCube. A couple of my friends brought the game and their GameCubes to another friend’s house, where we decided that we’d attempt to play through game in its entirety in one sitting. I stayed up through the early hours of the morning with a little TV in my lap. And though I didn’t complete the game, Resident Evil 4 remains one of my favorite games of all time. With such an immense (and rather subjective) appreciation for RE4, it was nearly impossible not to have high expectations for Resident Evil 5. I anticipated it to be everything that was awesome about RE4. In a way, that is what Resident Evil 5 is, but I’m getting ahead of myself a bit. As Resident Evil 5’s development was being covered by the gaming press, a few journalists raised some very serious concerns about the setting of the game, and I can’t say that these concerns were wholly unfounded. The pre-release footage depicted scenes of scary African zombies trying to violently murder Chris Redfield, a very Anglo-Saxon member of an international organization called the Bioterrorism Security Assessment Alliance [BSAA]. As I loaded up the game for the first time, I played close attention to possible racist imagery in the game. The opening cinematic explains the political situation that has given rise to a chemical weapons threat in Africa. That is why Chris has been asked to join Sheva Alomar in the impoverished town of Kijuju to investigate the situation. I noticed a couple different things during this opening cinematic. First, the game looks great in 720p. Seriously, this is one of the best looking games I have ever seen. Secondly, I discovered Capcom’s solution to the accusations of racial insensitivity. They replaced several of the native African characters with Caucasian and Mid-Eastern character models. This was obviously a less expensive fix than adding some content that actually demonstrates some form of inter-racial compassion. How about a short addition to the opening cinematic in which Chris gives some candy to a group of African children? Did I mention that the game looks really, really nice? Resident Evil 5 plays just like Resident Evil 4. In fact, I found RE5 to be everything that I loved about RE4 5 years ago. Its fast paces, tense, and challenging. However, I (and most other residents of 2009) wouldn’t have been upset if Capcom had decided to ditch the rather cumbersome RE4 control scheme. I hated not being able walk and shoot at the same time. However, this is something that I decided to look past... as though I had a choice. Part of what made Resident Evil 4 so frantic was the control scheme, which was a big step forward from its precursors. I can understand why Capcom wouldn’t want to risk messing with the equation. That’s fine. I accepted it. I got used to the controls without too much difficulty. But, I see no reason that Capcom shouldn’t adopt a more streamlined set of controls (see any modern western-developed shooter) for the inevitable Resident Evil 6. Occasionally, the tasks in Resident Evil 5 require Chris and Sheva to take different paths. These segments, which require Sheva to think for herself, draw attention to her inability to do so. For example, at one point early in the game we found ourselves locked inside of a building. The solution to this was to toss Sheva from the top of that building to the top of a neighboring building. Then I had to keep the zombies in the other building from eating her face (by way my sniper rifle). However, she does carry a weapon and can (sort of) defend herself. Perhaps, I should thank Capcom for not making Sheva as annoyingly vulnerable as the President’s daughter in Resident Evil 4. At no point is Sheva’s artificial intelligence more irritating than in the final boss battle. Without spoiling anything let me tell you: it was wretched. When you combine Sheva’s impropriety with limited supplies of ammo and a less-than-clear enemy weakness, you have a thoroughly infuriating experience. Eventually, I had to open up my partner to being controlled by a random kid from the internet, and even then it took us several tries to take down the boss. I still have no idea how we did it. Now, don’t let these complaints fool you. Trust my following unqualified statement: Resident Evil 5 is really awesome. One of my favorite parts of the last couple Resident Evil games has been what I refer to as the “after party”. After you complete that tough last boss, you can play though the game again, carrying over your ammo supply and money. And as you play through over and over, you can save up enough money to purchase some pretty fabulous weapons. Add to that 61 trophies (or achievements if you’re an XBox 360 owner), and you’ve got dozens of hours-worth of reasons to keep playing. Contrary to what the prevailing majority of this little write-up might lead you to believe, I had a fantastic time playing Resident Evil 5. I think Capcom really succeeded in replicating the RE4 experience. In fact, I could reduce my explanation of the game to being Resident Evil 4 in 720p with the good (but not perfect) addition of cooperative play. And if that statement is meaningful to you in any way, I would recommend checking this game out. first complaint of the game. aiming reticle and lack there of. i cant tell you how much that pains me. i do however feel i must once again stand up for the shooting system in resident evil games. i feel that while not being able to move and shoot is frustrating, i believe that little addition (or subtraction) is part of what makes these games different. if i wanted to run around with a machine gun and shoot people i would jump on another game. but being forced to stop and aim at a horde of zombies makes me feel more theatrically involved and also sense a more realistic (absurd when talking zombies, but meh) effect. moving and shooting is hard. then add the fact that zombies (or parasite infected fellows) are coming to maul you with their bare hands. while i think re4 is the superior game, i think they did a good continuation but perhaps strayed a little to far from the formula. I have to agree with you here. RE4 found a nice sweet spot between being a shooter and a survival game. The setting and controls made for a fantastically creepy game. And I also agree that RE5 did a pretty good job in continuing the series aside from a few minor annoyances.